ALM HM are stockists of the Timeless Collection offered by Alu FX® Patina. The Timeless Collection consists of just 5 unique Aluminium painted finishes designed to offer clients a high end aesthetic on a low budget. The finishes available replicate some of the most popular colours in architecture today at a fraction of the cost. Not only are they the same colour, the finishes are brushed and textured to give a true representation of the metals they imitate. Alu FX® is not a direct replacement for these materials, it’s an Aluminium based material with a guaranteed painted finish allowing clients to obtain that high end look where previously this aesthetic appearance would have been way over budget. Unlike many Aluminium colours on the market, Alu FX® is available from stock giving short lead times and quick turnaround. Alu FX® Patina Timeless Collection is currently available in 0.7mm thick, 100kg coils x 600mm wide giving a seam centre of 530mm. This width and thickness is ideal for standing seam roofing and cladding as well as shingle and flat lock tiles. Many other widths and thicknesses are available in both sheet and coil, but as they are non stock items, they would be subject to a minimum order quantity and a ten week lead time from receipt of purchase order. If this is acceptable, we can offer a much wider range. 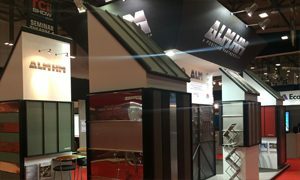 The Aluminium material used for Alu FX® is manufactured to the highest standards meeting and exceeding EN requirements. Providing the material is installed correctly using a high performance vapour barrier such as WARMFAST VB, building owners can enjoy a life expectancy of 40/60 years + (standard expectation for Aluminium) with all finishes covered by a 10 year warranty (subject to use and location). Due to the high salt content in the air, it is not recommended to use Alu FX® within 2 miles of a coastal location. Whilst the metal is suitable for coastal environments and will perform for many years, salt can attack the painted finish, diminishing the overall aesthetic. surface of rolled Zinc. Timeless Grey is the same thickness as Zinc, yet the weight ratio for Aluminium is far better at 1.9kg per m2, against Zinc at 5.04kg per m2. Alu FX® – Timeless Black gives the effect of a black anodised metal surface. Its low reflective coating offers a deep black visual unaffected by run off issues associated with naturally weathered materials. Furthermore, traffic film and localised airborne dust can be washed off, bringing the surface back to an even finish.Weight 1.9kg per m2. Alu FX® – Timeless Steel Oxide is a textured coating layered in such a way that the smooth surface still has a depth which reflects different levels of colour tone at different angles. Intended to look like aged or rusting steel, without the associated high costs, heavy installed weight and known run off issues, some say it also looks like a mottled Brass or Bronze. Whichever your view, the rich colour will offer a lightweight and highly cost effective alternative. Weight 1.9kg per m2. Alu FX® – Timeless Bronze offers a low reflective yet lustrous colour providing a high end material aspect at low end cost. The surface finish has a brushed effect giving the appearance of a rolled metal and unlike naturally weathered bronze that blackens over a period of 3/5 years due to the weathering process, Timeless Bronze will still look the same colour as when installed. Weight 1.9kg per m2.2. Alu FX® – Timeless Semi-Oxid offers a rich dark brown finish which is brushed and textured. The brushed surface reflects light from different angles giving the desired appearance of a metal grain. With natural rolled metal surfaces, this desired brushed effect weathers out over 3/5 years. Being a painted finish, the grain brushed into Timeless Semi Oxid will still be visible. Weight 1.9kg per m2. Suitable for double lock standing seam roofing and cladding / shingle and flat lock tiles etc.